Start clicking on Thursday June 21st at 11:00am EST and don’t stop until Wednesday July 18th at 11:59pm EST. You can win one item per Webkinz World account per day! You must have a Webkinz World account to use the prize. Some prizes are more rare than others. Play Plumpy’s Summer Sensation Peek-A-Newz Challenge to win some Webkinz Newz exclusive prizes! 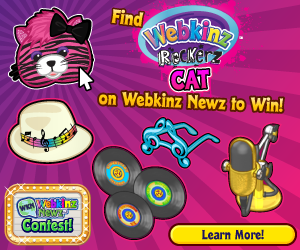 Look for the floating Webkinz Rockerz Cat on Webkinz Newz and you could win a Webkinz Newz excusive Webkinz Rockerz prize! Look for the Precious Treasures ad on Webkinz Newz to win some special prizes! Parent Club: Look for the special City Styling ad (displayed below) between June 13th, 2012 and July 5th, 2012 to win some amazing city styling prizes! Potential prizes include: City Skyline Armchair, City Skyline, Side Table, City Skyline Tuckaway Trunk, Swanky Pink TV, Mocha Magic Low Bed, Hot Pink Cool Fridge, Glass Top Pink Stove, Fabulous Fuchsia Sofa, Frosted-Top Dining Table Tri-Mirror Mocha Dress Pretty in the City Painting, Fabulous Fuchsia Armchair, Pretty in the City Panel Painting. Start clicking June 13th! You can win one item per Webkinz World account per day! The contest opens at 3:00pm EST on July 13th, 2012 and ends at 11:59pm EST on July 5th, 2012.